Launceston Salvation Army | Launceston Then! Launceston Salvation Army Hall, Tower Street. 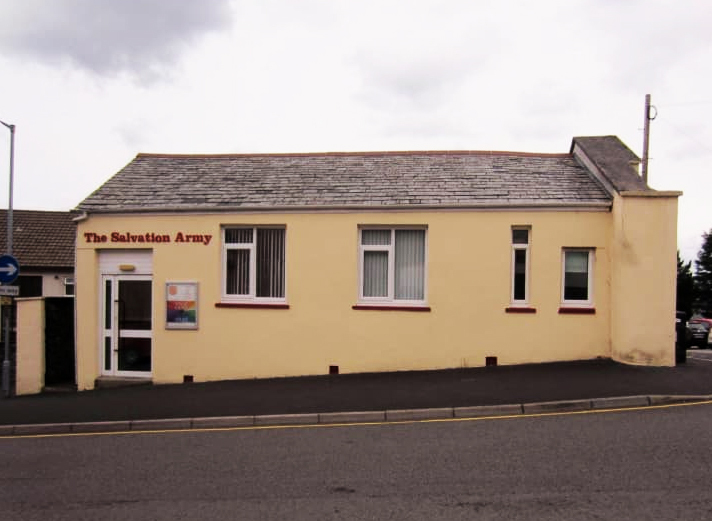 The Salvation Army is the outcome of revival mission meetings conducted in London in 1865 be the Rev. William Booth, a former Methodist minister, and his wife Catherine. Its aim was to preach the Gospel to those untouched by ordinary religious efforts. The converts were advised to join some church, but many were not welcomed be the churches, and moreover felt ill at ease among people of a different social stratum. So the Christian Mission was founded. The name of the Mission was changed to ‘Salvation Army’ in 1878. William Booth was born in 1829 and died in 1912. He and his future wife, Catherine Mumford, were Wesleyan Methodists, but were dismembered in the troubles of 1849. The autocracy of Dr. Bunting, very different from the spirit of John Wesley, largely caused the loss to Methodism of 100,000 members. In 1852 Booth became a minister of the Methodist New Connexion, from which he retired in 1861. During the four years from 1861 to 1865 he conducted many evangelistic meetings in Cornwall in which thousands professed conversion. Large numbers professed in the town of Hayle. Booth was an intense evangelist with great humanitarian sympathies. All Salvationists must be total abstainers, and those holding any kind of office, non-smokers. This rule also obtains in the American Methodist Episcopal Church, where ministers are not allowed either to drink or smoke. A great principle of the Army is the equality of the sexes. This equality with regard to privilege and position is absolute. The dignity and worth of women equals that of men. With regard to marriage, officers can only marry officers. Like the Quakers, the Salvation Army does not hold sacramental services in which they partake of the Elements, but this omission does not prevent them from showing to the world an unusual spirit of Christian zeal and sacrifice. All officers, high and low, receive very meagre salaries. For some years fines and imprisonment were imposed upon Booth’s followers as breakers of the peace, but after 1889 there was little opposition. In 1880 the Salvation Army went to the United States and in 1881 to Australia, afterwards to the European continent, India, Ceylon, and other places. The Western Subscription Rooms, Westgate Street. Captain Herbert Lindsay was the officer who began Salvation Army work in Launceston in the year 1882, and although no great strides were made, there was a steady progress. A Corps was soon established and at first worship was held at the Western Subscription Rooms (present day office of the Cornish and Devon Post). Afterwards they moved to a hall in Tower Street, which they purchased in 1943. Joseph Maunder, the rope maker (great grandfather to the present owner of Maunder and Sons), was the first convert under Captain Herbert Lindsay about the year 1882, and was faithful to the Army until he died in 1923 aged 67. Joseph was of a bright and cheerful disposition, and went by the name of ‘Happy Joe.’ It was he in the early days who led the singing with his concertina, and he would often lead the Sunday afternoon Testimony Service. Another early convert was Thomas Penny. He went by the name of ‘Dad Penny.’ He was a drummer in the early years and was held in high esteem by his Army friends. Launceston Salvationists shared in the general opposition of the early years. Rotten vegetables were thrown at them as they marched and one officer was roughly used and dragged in the mud. After about three years obstruction ceased. A shoemaker was summoned for assaulting Captain Bushell. This caused great indignation in the town, and a larger number of men assuming the role of skeletons have for several nights hovered about the flanks of the Army and impeded their processions, the hostile manoeuvres of the skeletons being accompanied with great uproar…. The disorder was intensified on Tuesday evening, when the Salvationists in their march through High Street, Broad Street and Westgate Street were subjected to increased violence desperate efforts being made to lay hold of the banner and several times the procession came to a standstill, the encounters being of a very fierce nature.” The Salvationists got to the Western Room with their banner on this occasion, but it was stated that P.C. Kittow received a violent blow from a stick. These disturbances took place in spite of an appeal to the residents by Dr. Thompson. He appealed in the Town Council before the Salvationists came to Launceston, and when there was only one constable in the town. He asked the people to refrain from any disturbances such as had occurred elsewhere. 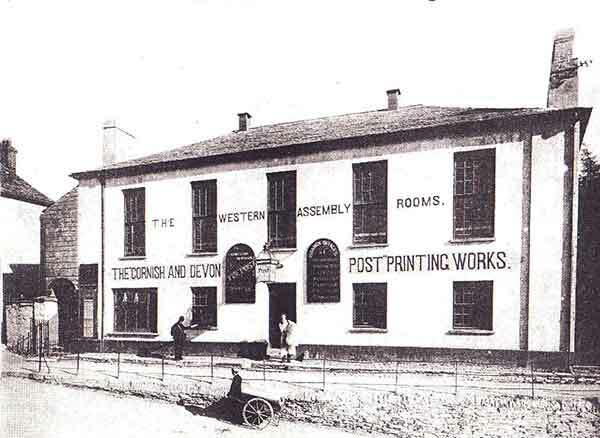 The Army are still going strong to this day, with their hall still situated in the re-developed Tower Street. By research conducted by Rev. G.W. Hicks, 1943.